HfS' Saurabh Gupta recently caught up with Brian Behlendorf (see bio), the Executive Director of Hyperledger at the Linux Foundation. Brian was a primary developer of the Apache Web Server – the most popular web server on the internet. He was a founding member of the Apache Software Foundation, the founding CTO of CollabNet, the CTO of the World Economic Forum, and the managing director at Mithril Capital Management LLC before heading Hyperledger. He is also a board member of the Mozilla Foundation since 2003 and the Electronic Frontier Foundation since 2013. Two decades after developing the Apache HTTP server that played a key role in giving us the internet and the web, Brian is reimagining our world again with blockchain. We discussed a range of topics around the reality and practicality of blockchain for enterprises along with the one wish that he wants to come true. Saurabh Gupta, Chief Strategy Officer, HfS Research: Brian, one of the stated goals for Hyperledger is to create enterprise grade frameworks and solutions. Why do you think enterprises should adopt blockchain? 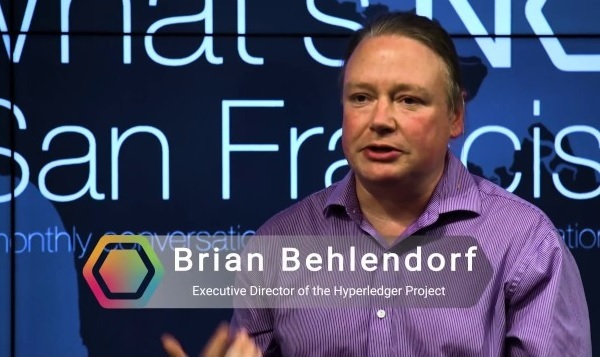 Brian Behlendorf, the Executive Director of Hyperledger at the Linux Foundation: We have lots of transaction networks that, Saurabh, because of historical network choices, have resulted in many central actors who facilitate digital transactions like a hub in a hub-and-spoke network. And we have to proxy our trust to them - sometimes they do a noble job and charge a nominal rate, but there are times when these central actors charge unreasonable double-digit rates. Blockchain allows business models to become more equitable and agile by behaving more like the internet. The cryptocurrency community has produced a lot of interesting technological advancements, and there are valid and worthy uses for them, but the majority of the enterprise market is looking for a consortium approach – one that still sees a representative organization to set the rules of a market, but where the market operates more directly peer-to-peer and distributed, rather than all transactions going through that central party. These consortia can upgrade the rules from time to time with the consent of the market, , and help define and enforce a set of legally binding agreements to cover situations that the technology does not cover. As an example, an organization like SWIFT can reinvent their current offerings as distributed ledgers, to not only optimize the product (reduce turnaround time from 3 days to 5 mins) but also make them more accountable to their member backs. Essentially, they become referees on a football field, instead of the quarterback. It’s not just financial markets; we can re-invent claims processing with distributed ledgers and smart contracts to make it is less bureaucratic. We can share patient records with strong audit and access control. There are use cases across healthcare, supply chain provenance, and many industries. These may sound like disparate use cases, but it’s similar to how TCP/IP transformed the world in the 1990s….who thought that an online bookstore would become the most valuable company 20 years later, but it did. Saurabh: Why should enterprises look at Hyperledger? There are so many different permissioned and permissionless frameworks out there, so what is the elevator pitch? Brian: As new technology develops, there is a call for standards. Participants want to focus on time and effort and investment to build solutions versus worrying about the framework. This is the rationale for open standards. There has been a linear progression from open standards to open source software. While financial firms are behind the curve, if they want to get behind this idea you need everyone else to adopt it…and that requires open source. That is why we are pulling together the most exciting portfolio with a multi-lateral developer and vendor community. As a result, clients don’t just have to go to IBM; they can reach out to Accenture or Wipro or frankly hundreds of other startups and still get the same basic technical architecture. It’s similar to the benefits that Linux brought to the world of operating systems. Saurabh: We recently saw the release of Hyperledger Fabric 1.0 (see blog) and even wrote our perspective on it. So what, Brian, should we expect going forward from Hyperledger? Brian: Hyperledger Fabric version 1.0 is not the end but the beginning. We are already working on version 1.1 which is a logical progression from 1.0. We will also launch Hyperledger Sawtooth version 1.0 and possibly some others in the near future. We are also starting to see a lot of collaboration between projects. For example, Hyperledger Sawtooth and Hyperledger Burrow are working together to run the Ethereum Virtual Machine (EVM). This kind of mixability is what we are working on all our projects. Over time they converge to tell the full story that is built under the same umbrella with the same legal framework. Saurabh: So what’s your advice to enterprises regarding when to consider blockchain and when not to? Brian: With every use case for distributed ledger technology, there is always a question whether it could be cheaper to do it as a centralized architecture. And the answer is yes! BUT: then you enable a central actor, and that is what markets want to get away from. The first question enterprises should ask is around how are they doing things now, and are the bottlenecks due to centralization? If you are paying a 1% fee or less, and the centralized actor is well managed and doesn’t also compete with its market members, then possibly blockchain is not the answer in the short-term. But if not, then you should go to your stakeholders and participate in a blockchain solution. I believe that every such scenario will go towards blockchain, but that is a 20-year vision. Right now we should be looking at the low hanging fruits. Saurabh: There are lots of pilots and PoCs around blockchain, Brian, but rarely do they go live. What needs to happen for blockchain to become a reality for enterprises? Brian: What we need to do is build confidence in technology leadership that blockchain technology can scale up to performance levels that enterprise requires. We have established a Hyperledger Performance Working Group which is a cross-project initiative to build a repository of test scripts, develop benchmarking tools, etc. to help IT leaders understand what the tune-able attributes are. A lot of Fabric 1.0 enhancements were around guaranteeing performance and improving DevOps such as assigning different roles to different nodes that are different from standard blockchain architecture but helps improve some latency factors. There is a recognition to make it real, and we are putting a lot of effort into it. Projects like Hyperledger Cello (as-a-service deployment model) and Hyperledger Composer (collaboration tool) are also enabling adoption. Brian: By an order of magnitude, more developers - a thousand more developers that are one year further down the learning curve. I talk to many companies on participation formalities, but the thing that I want them to contribute is developer resources to write code…I am not compensated by revenue targets, success for me is becoming the reference standard for distributed ledger technologies. Blog Post: Will Infosys revitalize the mortgage processing market with ABN Amro’s Stater, or is this merely sweating a commodity asset?